To install the shelves for the large 40" Verdera cabinets (K-99010, K-99011), door removal is required. To ease removal, all doors on the large cabinets are equipped with quick-release hinges. IMPORTANT! 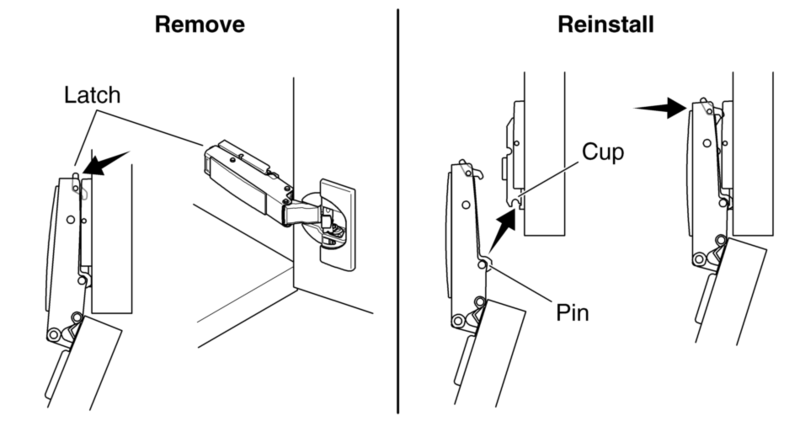 Do not leave the door supported with only one hinge during removal or reinstallation. Disengage the bottom hinge first during removal, and reattach the top hinge first during installation. With one hand, support the door in the open position. Starting with the bottom hinge, press the latch at the end of the hinge to release it from the bracket. Repeat for the upper hinge. Move the door forward to slide the hinges off the brackets. Starting with the top bracket, align the hinge pin with the cup of the bracket. Press the back of the hinge to snap the latch onto the bracket. Repeat for the lower hinge. Open and close the door to ensure proper operation.